Who is up for a mountain sweet of melon that weights 2kg? Left is a “Mega Mountain” sweet of a giant melon that weights 2kg. Right is an ordinary “Melon Mountain”. SAIJYO, June 10 — A Japanese farmer co-operative café has introduced a sweet treat, containing a giant melon that weighs 2kg. 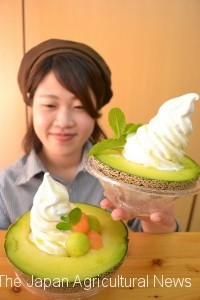 Created by the café in Saijyo city, Ehime prefecture, the sweet uses a melon cut in half, which has a diameter of 18 cm. The café names it “Mega Mountain” priced at 1,500 yen ($14). The café sells “Melon Mountain” that uses an ordinary-sized melon at 880 yen ($8). But the sizes of harvested melon are bigger this year, the café operator said.